Cardiac imaging is used to detect and diagnose the presence of diseases in the heart, well before symptoms actually occur. This can help lower the risk of heart attacks, which is the leading cause of deaths in the United States. There are various types of cardiac imaging services. We offer several different types. Computed Tomography (CT) Coronary Calcium Scoring is used to identify if a patient has coronary artery disease (CAD) also called atherosclerosis or "hardening of the arteries". This is the leading cause of death of men and women in the United States. Coronary artery disease occurs when the walls of the arteries that supply the heart with oxygen and blood thicken and create a reduced area for blood to flow through. The arteries narrow and harden because of plaque build-up. Over time, the plaque can rupture, leading to even greater blockage and contributing to heart attack or sudden death. Calcium is a marker for coronary artery disease. The earliest indicator of coronary artery disease is this calcium buildup. 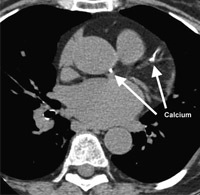 CT Coronary calcium scoring takes detailed images of the major arteries of the art and assesses how much calcium build up there is inside of them and provides a calcium score. The calcium score helps doctors determine the extent of disease, establish prognosis, and plan for treatment and is available at our cutting-edge Los Angeles imaging center. Before your Los Angeles cardiac imaging exam begins, electrocardiograph (ECG) electrodes are attached to the patient's chest. The electrodes record the electrical activity of the heart and make it possible to record the CT scan when the heart is not contracting. For the scan, patients are positioned on a narrow table that glides into the CT machine. The procedure usually takes about 10 minutes and does not require any needles or injections. When certain factors are present, it is of the utmost importance that you consider getting a coronary calcium scan. Some of these factors include: family history of heart disease, obesity, diabetes, high blood pressure, no regular exercise, high stress in life, high cholesterol level and smoking. These factors can increase your risk of developing coronary artery disease. SPECT stands for Single Photon Emission Computed Tomography. It’s also commonly called a cardiac stress test. This determines the heart’s blood supply. When someone has a heart attack, myocardial perfusion SPECT can be used to determine the extent of damage caused by the heart attack, and to examine obstructed blood vessels that cause reduced blood flow. Myocardial perfusion SPECT is done in two parts. The first part takes images of your heart while it is resting; the second part takes images while your heart is in a state of stress (normally induced by exercise). The procedure is done by injecting radioactive tracers into your blood. The tracers combine with your blood and are pumped into your heart. The gamma camera picks up signals from these tracers as they move around your chest. The computer then converts these signals to images, allowing the doctor to see what is happening in your chest, as the blood with tracers moves around. With these images, your doctor can see if your heart is getting enough blood flow, or if areas of the heart have reduced blood flow due to narrowed arteries. These images are also produced separately when your heart is in a period of stress. This allows your doctor to examine how well your heart handles stress. This stress period in the heart is created by either having you exercise, or if you can’t exercise, by giving you a medicine to increase the flow of blood to your heart. The amount of radiation in the tracers is minimal: your body should dispose of it through your kidneys within 24 to 72 hours. If you’re interested in learning more about either of these procedures, or any of our other cardiac imaging services, please contact our office today. We offer other methods of cardiac imaging in Los Angeles, in addition to the CT calcium score method and the myocardial perfusion SPECT method.